Bill Clark's pace made him a highly effective back-row for New Zealand, with his surging attack complemented by good defensive spoiling. He was also frequently called into the backs as, in an era before replacements, he was able to provide plenty of cut and thrust. 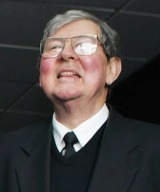 He fulfilled this role in three Tests of the classic 1956 series against the Springboks, winning two. He also scored a try in New Zealand's infamous loss to Wales in 1953 - although he also conceded a controversial penalty to level the scores late in the game. While he only played nine Tests for the All Blacks he also played 15 tour games and was a regular for Victoria University, New Zealand Universities and Wellington.